The Dachshund is clearly the best dog in the world. These little fellas were bred to hunt small game and are fearless. They certainly know their own mind and have a lot to say for themselves. 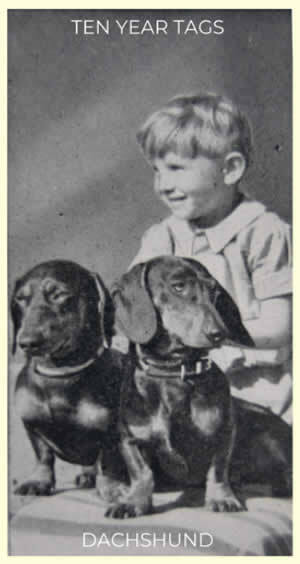 Dachshunds are affectionate, fun-loving and will need plenty of exercise and mental stimulation to keep them happy. The Dachshund is also extraordinarily handsome. We Guarantee to replace your tag for 10 years, should it be lost, wear out (unlikely), or otherwise damaged. Minimal T&C apply. We got tired of our dog’s name tag getting lost, fading away, or just falling to bits. So we made a better one. Buy Your delightful Dacshund a Deeply Engraved Solid Brass Dog ID Tag Today! Buy your dog a Dog Name Tag Guaranteed for Ten Years, Even If You Lose It… for £10!